Discarded furniture, found industrial remnants, and decades of combined artistic experience come together through the eyes of Northeast Ohio artists Bret Hines, Terry Klausman and Gwen Waight. 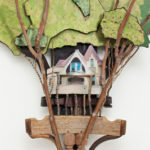 A major new exhibition, TIME CAPSULES, opens January 30 at Summit Artspace Gallery and will be on view through March 7. 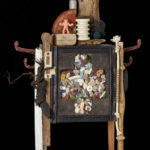 This stunning exhibition features expressive 3D collages, better known as assemblages, covering months of work from these three talented artists, offering ingenuity and creativity. The sculptures invite the viewer on a journey to excite the senses — from the past to the present; we reminisce on narratives from our lives, which relate to these modern thought-provoking works of art. This exhibition was organized by participating artist, Terry Klausman. “What does TIME CAPSULES mean to me? Well, at first all I could think of was your typical cylinder stuffed with newspaper clippings and odd memorabilia. As I started to work on pieces for this show, it became more about capturing time or significance. ” – Gwen Waight. Opening Night Party — Friday, January 30, 5 p.m. – 8 p.m. Attendees will get a “first-look” of the exhibition. The evening will feature refreshments. ART TALK: Time Capsules, Sculptural Collages — Thursday, February 5, 7:30 p.m. Meet the artists behind Time Capsules as they discuss the importance of found objects and their personal histories with creating sculptural collages. ArtWalk — Saturday, February 7, 5 – 9 p.m. The gallery will be open, along with other special events such as Crafty Mart. 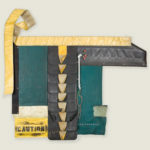 WORKSHOP: Lost & Found, Repurposing Found Objects — Saturday, February 21, 1 p.m. Join Gwen Waight for this hands-on interactive workshop and learn creative methods to using found items in unexpected ways. Participants will each create one work of art. Workshop is free and open to the public. ART TALK: Soundscapes, Collaging with Sound — Thursday, February 26, 7:30 p.m. Composer Jacob Trombetta will discuss the sounds from our past and their influence on music today. From synthesizing to sampling, you don’t want to miss this compelling take on “collaging with sound”. ArtWalk, Closing Reception — Saturday, March 7, 5 – 9 p.m. The final day of the exhibition will bring other special events such as Crafty Mart.